Nintendo's heroes return to battle one another. All of the classic fighters return, plus a few new faces from Nintendo's back catalogue. The new 1P Adventure Mode introduces side-scrolling platforming sections between fights, while the updated Classic Mode will randomise your opponents. The multiplayer game has also been expanded with a new range of specialist and tournament options. As well as more characters, stages and items than before, Super Smash Bros. Melee also introduces Trophies, collectable figurines of characters from throughout Nintendo's history. 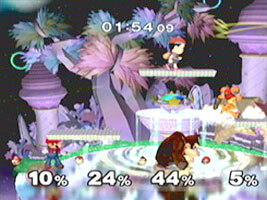 There are many characters, stages, items and more in Super Smash Bros. Melee that originated in other games. Find out more here. Descriptions of all the trophies in Super Smash Bros. Melee.